I was driving the back roads yesterday headed for our summer veggie and flower outside market, and as I drove along I kept seeing things that disturbed me somewhere within. I was saddened by the poverty that I saw, not that people had less money, but because of a lack of money there seemed to be a lack of self worth as well. Wherever there seemed to be poverty there also seemed to be trash littered about, junk, old cars, you name it. These two scenarios go hand in hand wherever I looked. As I thought about this I came to believe the lack of money not only destroyed ones self worth it destroyed the desire to care about oneself and worse, to have hope. Nobody should have their lives devastated like this. Every single person on the planet has the right to fulfill their dreams, have hope, and be who they want to be. We have lived next to this destruction of life and turned a blind eye to it forever, as long as our lives were okay then the world was okay. Well it’s not okay, and this should be one of our first missions in restoring the world to balance. ALL people are created equal and have the right to live equal lives. It is shameful what we have all allowed to happen to our fellow man and it keeps on happening. Somewhere along the journey of life we were taught to believe that this was just a fact of life. Some people were rich and many were poor. I find that that very disturbing, first because we believed it, and second that we just went along with the program. Where was our desire to help raise others up out of the squalor and have a better life? It is stunning to see just how low we have fallen, how stripped of our caring we allowed to take place. Our greed was so profound we drowned ourselves in it, we became animals and forgot about being people who knew better. We just moved ourselves across the rail road tracks to a better part of town and left the poverty behind, rather than fixing the problem we ignored it. Our Government promoted this sick way of thinking, pushing us all into becoming consumers at all costs, even at the costs of our fellow man. The Government was in its beginning stages of creating class differences to weaken the power of the people. We questioned nothing, we continued on with their agenda and the divide amongst the people began to grow. It continues to grow to this very day, the middle class has all but been eliminated as the rich get richer and the poor begin to drown. Changing this world begins with each and every one of us, rich and poor. 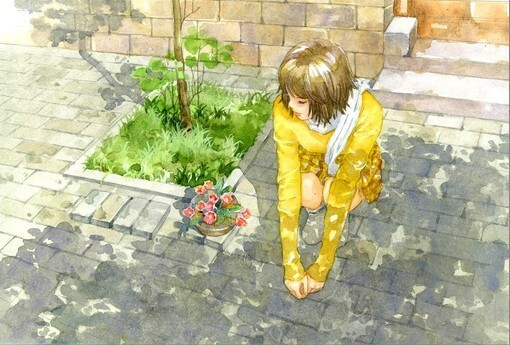 Like the picture above, one small flowering plant can change the feeling of a city street. Imagine if everyone was putting down flowering plants to brighten the hearts of the down trodden. If an empty lot never sees new life built upon its soil, turn it into a productive garden to feed the people the fresh vegetables inner cities don’t provide. We are the ones that will change the world when we stop looking away and tackle the issue of inequality head on, one person, one town, one city at a time. Until we step up to the plate and say to ourselves this is not acceptable, nothing will change. The change begins with us, how we view life, how willing we are to awaken to the love we all must share with one another. We have played the selfish role long enough, our excuses are dwindling allowing this uncouth behavior to continue. We need to make inequality as unacceptable as we did fur coats. There are hundreds of ways to help lift up someones life if we choose to look for them. We can choose to stop instead of walking on by for starters, and the poverty stricken must do their part as well. They need to go deep within and revive the desire to make their lives better, if only by putting a small flowering potted plant on their sidewalks instead of trash. If we all work together we can begin to make a difference. We all know of an empty lot in the town or city we live in. Instead of driving by them, begin groups that can turn them into producing gardens, feeding the hungry, raising up spirits, restoring the will to go forward and bringing people together. Take old run down buildings sitting vacant and turn them into community centers, meeting places where community can begin to rebuild. We have lost our sense of community, our abilities to share, our desires to reach out and help. This is how we can begin to help the world, one street, one town, one city at a time. We are needed to awaken and see the truth around us and stop living in the haze of lies. If we want a better world it is up to us to build it! This entry was posted in Article, Links, reblog and tagged 2012, 28 May, Disclosure, Improving The World Starts With Us, spiritual, Spiritual evolution, Visionkeeper, World. Bookmark the permalink. An excellent piece on being part of the community and getting involved to fix it up. We all can do something in small ways that together will make big changes. An excellent piece on being part of the community and getting involved to fix it up. We all can do something in small ways that together will make big changes. Thank you, VK!